CHENNAI: T R Baalu, the UPA's surface transport minister and a key DMK man, has been accused of arm-twisting officials of the petroleum and natural gas (PNG) ministry over the past two years, to bend the rules and provide gas from the Cauvery Basin to two companies owned by his sons, and in which both his wives are large shareholders. The two companies are Kings India Power Corporation and Kings India Chemical Corporation. Both of Baalu's wives, T R B Porkodi and B Renukadevi, are shareholders according to Baalu's affidavit of assets filed before the Election Commission (which can be seen at http://archive.eci.gov.in/GE2004_Affidavits/Ta mil%20Nadu/GE/3/BAALU_TR/BAALU_TR% 20_SC2.html). The son with the bulk of responsibilities is the Kings Chemical chairman, T R B Rajkumar. The accusations have been made in a petition to Prime Minister Manmohan Singh, by politician Subramanian Swamy two months ago. Swamy is up in arms against Baalu's ministry over the Sethusamudram Canal project, which he opposes. The PM has asked the Central Bureau of Investigation to "verify" the facts, a pre-inquiry exercise. When contacted about the allegations, Baalu told Express: "Since Swamy has made the allegations to the PM, it is for the PM to reply." In a March 2, 2007 letter to R.S. Sharma, the chairman & managing director of the Oil and Natural Gas Corporation (ONGC), the CMD of the Gas Authority of Indian Ltd (GAIL), Dr U D Choubey says that in a June 28, 2006 meeting with the PNG minister and Baalu, "it was considered that ONGC will look into “additional availability of gas" to Kings Chemicals and Kings Power. In other words, Baalu told the PNG companies to supply gas to his family's companies. While the mere act of summoning officials to help out one's own family's company is ethically dubious, in this case it has run into legal problems. Gas from Kuttalam and Narimanam zones of the Cauvery Basin was officially awarded to the two companies in 1998-98, but the allocation lapsed (despite repeated extensions). The matter is now in two high courts, Madras and New Delhi. The details are in the graphic. According to the PNG ministry's submission to the Delhi HC, Kings Power was given gas at Rs 654 per million metric standard cubic metre (MSCM), but they wanted the charges reduced to Rs 250 per MSCM. Kings Power could not sign the final papers, and after three extensions, the allotment was cancelled in 2002. With Kings Chemicals, the problem was of high transportation charges and the fact that the company wanted, as an alternative, gas from the Kovilkalapal zone,which would have made a dent in the supply to the Tamil Nadu Electricity Board. This allotment was also cancelled in 2002. Things revived once the UPA came to power and Baalu got into the act. 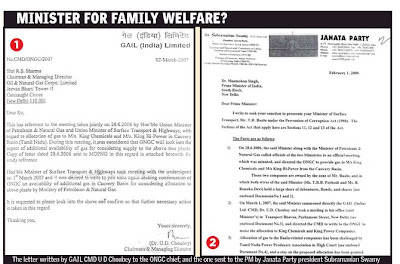 The surface transport minister again summoned the GAIL CMD on March 1, 2007, and told him to direct ONGC to supply gas to his family's companies (see the CMD's letter). The problem came a few months later,when the Tamil Nadu Power Producers Association went to court both in Delhi and in Madras against the allocation Baalu had ordered. Both courts stayed the allocation. On top of all this, Kings Chemicals figures in the 2004 list of Tamil Nadu bank loan defaulters: it defaulted on a Rs 4.35 crore loan from IDBI, and a Rs 1.93 crore loan from IFCI. The law bars the government from giving to defaulting companies the kind of consideration Baalu is looking for.